20Health Services Research Unit, University of Aberdeen, Aberdeen, AB25 2ZD, UK. Non-randomised studies of the effects of interventions are critical to many areas of healthcare evaluation, but their results may be biased. It is therefore important to understand and appraise their strengths and weaknesses. We developed ROBINS-I (“Risk Of Bias In Non-randomised Studies - of Interventions”), a new tool for evaluating risk of bias in estimates of the comparative effectiveness (harm or benefit) of interventions from studies that did not use randomisation to allocate units (individuals or clusters of individuals) to comparison groups. The tool will be particularly useful to those undertaking systematic reviews that include non-randomised studies. Non-randomised studies of the effects of interventions (NRSI) are critical to many areas of healthcare evaluation. Designs of NRSI that can be used to evaluate the effects of interventions include observational studies such as cohort studies and case-control studies in which intervention groups are allocated during the course of usual treatment decisions, and quasi-randomised studies in which the method of allocation falls short of full randomisation. Non-randomised studies can provide evidence additional to that available from randomised trials about long term outcomes, rare events, adverse effects and populations that are typical of real world practice.1 2 The availability of linked databases and compilations of electronic health records has enabled NRSI to be conducted in large representative population cohorts.3 For many types of organisational or public health interventions, NRSI are the main source of evidence about the likely impact of the intervention because randomised trials are difficult or impossible to conduct on an area-wide basis. Therefore systematic reviews addressing the effects of health related interventions often include NRSI. It is essential that methods are available to evaluate these studies, so that clinical, policy, and individual decisions are transparent and based on a full understanding of the strengths and weaknesses of the evidence. In this paper we describe the development of ROBINS-I (“Risk Of Bias In Non-randomised Studies - of Interventions”), which is concerned with evaluating risk of bias in estimates of the effectiveness or safety (benefit or harm) of an intervention from studies that did not use randomisation to allocate interventions. We developed the tool over three years, largely by expert consensus, and following the seven principles we previously described for assessing risk of bias in clinical trials.8 A core group coordinated development of the tool, including recruitment of collaborators, preparation and revision of documents, and administrative support. An initial scoping meeting in October 2011 was followed by a survey of Cochrane Review Groups in March 2012 to gather information about the methods they were using to assess risk of bias in NRSI. A meeting in April 2012 identified the relevant bias domains and established working groups focusing on each of these. We agreed at this stage to use the approach previously adopted in the QUADAS-2 tool, in which answers to “signalling questions” help reviewers judge the risk of bias within each domain.9 We distributed briefing documents to working groups in June 2012, specifying considerations for how signalling questions should be formulated and how answers to these would lead to a risk of bias judgement. We also identified methodological issues that would underpin the new tool: these are described below. After collation and harmonisation by the core group of the working groups’ contributions, all collaborators considered draft signalling questions and agreed on the main features of the new tool during a two-day face-to-face meeting in March 2013. A preliminary version of the tool was piloted within the working groups between September 2013 and March 2014, using NRSI in several review topic areas. Substantial revisions, based on results of the piloting, were agreed by leads of working groups in June 2014. Further piloting took place, along with a series of telephone interviews with people using the tool for the first time that explored whether they were interpreting the tool and the guidance as intended. We posted version 1.0.0, along with detailed guidance, at www.riskofbias.info in September 2014. We explained the tool during a three-day workshop involving members of Cochrane Review Groups in December 2014, and applied it in small groups to six papers reporting NRSI. Further modifications to the tool, particularly regarding wording, were based on feedback from this event and from subsequent training events conducted during 2015. Evaluations of risk of bias in the results of NRSI are facilitated by considering each NRSI as an attempt to emulate (mimic) a “target” trial. This is the hypothetical pragmatic randomised trial, conducted on the same participant group and without features putting it at risk of bias, whose results would answer the question addressed by the NRSI.11 12 Such a “target” trial need not be feasible or ethical: for example, it could compare individuals who were and were not assigned to start smoking. Description of the target trial for the NRSI being assessed includes details of the population, experimental intervention, comparator, and outcomes of interest. Correspondingly, we define bias as a systematic difference between the results of the NRSI and the results expected from the target trial. Such bias is distinct from issues of generalisability (applicability or transportability) to types of individuals who were not included in the study. Starting and adhering to the intervention as indicated in the trial protocol (sometimes referred to as the “per-protocol” effect). For example, in a trial of cancer screening, our interest might be in the effect of either sending an invitation to attend screening or of responding to the invitation and undergoing screening. Analogues of these effects can be defined for NRSI. For example, the intention-to-treat effect in a study comparing aspirin with no aspirin can be approximated by the effect of being prescribed aspirin or (if using dispensing rather than prescription data) the effect of starting aspirin (this corresponds to the intention-to-treat effect in a trial in which participants assigned to an intervention always start that intervention). Alternatively, we might be interested in the effect of starting and adhering to aspirin. The type of effect of interest influences assessments of risk of bias related to deviations from intervention. When the effect of interest is that of assignment to (or starting) intervention, risk of bias assessments generally need not be concerned with post-baseline deviations from interventions.13 By contrast, unbiased estimation of the effect of starting and adhering to intervention requires consideration of both adherence and differences in additional interventions (“co-interventions”) between intervention groups. We achieved consensus on seven domains through which bias might be introduced into a NRSI (see table 1⇓ and appendix in supplementary data). The first two domains, covering confounding and selection of participants into the study, address issues before the start of the interventions that are to be compared (“baseline”). The third domain addresses classification of the interventions themselves. The other four domains address issues after the start of interventions: biases due to deviations from intended interventions, missing data, measurement of outcomes, and selection of the reported result. 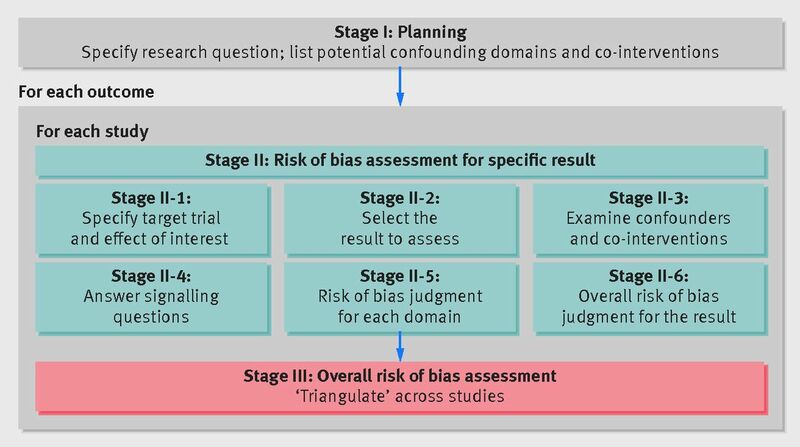 For the first three domains, risk of bias assessments for NRSI are mainly distinct from assessments of randomised trials because randomisation, if properly implemented, protects against biases that arise before the start of intervention. However, randomisation does not protect against biases that arise after the start of intervention. Therefore, there is substantial overlap for the last four domains between bias assessments in NRSI and randomised trials. Variation in terminology proved a challenge to development of ROBINS-I. The same terms are sometimes used to refer to different types of bias in randomised trials and NRSI literature,13 and different types of bias are often described by a host of different terms: those used within ROBINS-I are shown in the first column of table 1⇑. The full ROBINS-I tool is shown in tables A, B, and C in the supplementary data. It is very important that experts in both subject matter and epidemiological methods are included in any team evaluating a NRSI. The risk of bias assessment should begin with consideration of what problems might arise, in the context of the research question, in making a causal assessment of the effect of the intervention(s) of interest on the basis of NRSI. This will be based on experts’ knowledge of the literature: the team should also address whether conflicts of interest might affect experts’ judgements. The research question is conceptualised by defining the population, experimental intervention, comparator, and outcomes of interest (supplementary table A, stage I). The comparator could be “no intervention,” “usual care,” or an alternative intervention. It is important to consider in advance the confounding factors and co-interventions that have the potential to lead to bias. Relevant confounding domains are the prognostic factors that predict whether an individual receives one or the other intervention of interest. Relevant co-interventions are those that individuals might receive with or after starting the intervention of interest and that are both related to the intervention received and prognostic for the outcome of interest. Both confounding domains and co-interventions are likely to be identified through the expert knowledge of members of the review group and through initial (scoping) reviews of the literature. Discussions with health professionals who make intervention decisions for the target patient or population groups may also help in identification of prognostic factors that influence treatment decisions. Formulate an overall judgement on risk of bias for the outcome and result being assessed. Examination of confounders and co-interventions involves determining whether the important confounders and co-interventions were measured or administered in the study at hand, and whether additional confounders and co-interventions were identified. Supplementary table A provides a structured approach to assessing the potential for bias due to confounding and co-interventions and includes the full tool with the signalling questions to be addressed within each bias domain. The signalling questions are broadly factual in nature and aim to facilitate judgements about the risk of bias. The response options are: “Yes”; “Probably yes”; “Probably no”; “No”; and “No information”. Some questions are answered only if the response to a previous question is “Yes” or “Probably yes” (or “No” or “Probably no”). Responses of “Yes” are intended to have similar implications to responses of “Probably yes” (and similarly for “No” and “Probably no”), but allow for a distinction between something that is known and something that is likely to be the case. Free text should be used to provide support for each answer, using direct quotations from the text of the study where possible. Responses to signalling questions provide the basis for domain-level judgements about risk of bias, which then provide the basis for an overall risk of bias judgement for a particular outcome. The use of the word “judgement” to describe this process is important and reflects the need for review authors to consider both the severity of the bias in a particular domain and the relative consequences of bias in different domains. The categories for risk of bias judgements are “Low risk”, “Moderate risk”, “Serious risk” and “Critical risk” of bias. Importantly, “Low risk” corresponds to the risk of bias in a high quality randomised trial. Only exceptionally will an NRSI be assessed as at low risk of bias due to confounding. Criteria for reaching risk of bias judgements for the seven domains are provided in supplementary tables B and C. If none of the answers to the signalling questions for a domain suggests a potential problem then risk of bias for the domain can be judged to be low. Otherwise, potential for bias exists. Review authors must then make a judgement on the extent to which the results of the study are at risk of bias. “Risk of bias” is to be interpreted as “risk of material bias”. That is, concerns should be expressed only about issues that are likely to affect the ability to draw valid conclusions from the study: a serious risk of a very small degree of bias should not be considered “Serious risk” of bias. The “No information” category should be used only when insufficient data are reported to permit a judgement. The judgements within each domain carry forward to an overall risk of bias judgement for the outcome being assessed (across bias domains, that is), as summarised in table 2⇓ (also saved as supplementary table D). The key to applying the tool is to make domain-level judgements about risk of bias that have the same meaning across domains with respect to concern about the impact of bias on the trustworthiness of the result. If domain-level judgements are made consistently, then judging the overall risk of bias for a particular outcome is relatively straightforward. For instance, a “Serious risk” of bias in one domain means the effect estimate from the study is at serious risk of bias or worse, even if the risk of bias is judged to be lower in the other domains. It would be highly desirable to know the magnitude and direction of any potential biases identified, but this is considerably more challenging than judging the risk of bias. The tool includes an optional component to predict the direction of the bias for each domain, and overall. For some domains, the bias is most easily thought of as being towards or away from the null. For example, suspicion of selective non-reporting of statistically non-significant results would suggest bias against the null. However, for other domains (in particular confounding, selection bias and forms of measurement bias such as differential misclassification), the bias needs to be thought of as an increase or decrease in the effect estimate and not in relation to the null. For example, confounding bias that decreases the effect estimate would be towards the null if the true risk ratio were greater than 1, and away from the null if the risk ratio were less than 1. We developed a tool for assessing risk of bias in the results of non-randomised studies of interventions that addresses weaknesses in previously available approaches.4 Our approach builds on recent developments in risk of bias assessment of randomised trials and diagnostic test accuracy studies.8 9 Key features of ROBINS-I include specification of the target trial and effect of interest, use of signalling questions to inform judgements of risk of bias, and assessments within seven bias domains. The ROBINS-I tool was developed through consensus among a group that included both methodological experts and systematic review authors and editors, and was substantially revised based on extensive piloting and user feedback. It includes a structured approach to assessment of risk of bias due to confounding that starts at the review protocol stage. Use of ROBINS-I requires that review groups include members with substantial methodological expertise and familiarity with modern epidemiological thinking. We tried to make ROBINS-I as accessible and easy to use as possible, given the requirement for comprehensive risk of bias assessments that are applicable to a wide range of study designs and analyses. An illustrative assessment using ROBINS-I can be found at www.riskofbias.info; detailed guidance and further training materials will also be available. ROBINS-I separates relatively factual answers to signalling questions from more subjective judgements about risk of bias. We hope that the explicit links between answers to signalling questions and risk of bias judgements will improve reliability of the domain-specific and overall risk of bias assessments.14 Nonetheless, we expect that the technical difficulty in making risk of bias judgements will limit reliability. Despite this, ROBINS-I provides a comprehensive and structured approach to assessing non-randomised studies of interventions. It should therefore facilitate debates and improve mutual understanding about the ways in which bias can influence effects estimated in NRSI, and clarify reasons for disagreements about specific risk of bias judgements. Note that the tool focuses specifically on bias and does not address problems related to imprecision of results, for example when statistical analyses fail to account for clustering or matching of participants. We developed the ROBINS-I tool primarily for use in the context of a systematic review. Broader potential uses include the assessment of funding applications and peer review of journal submissions. Furthermore, ROBINS-I may be used to guide researchers about issues to consider when designing a primary study to evaluate the effect(s) of an intervention. The GRADE system for assessing confidence in estimates of the effects of interventions currently assigns a starting rating of “Low certainty, confidence or quality” to non-randomised studies, a downgrading by default of two levels.17 ROBINS-I provides a thorough assessment of risk of bias in relation to a hypothetical randomised trial, and “Low risk” of bias corresponds to the risk of bias in a high quality randomised trial. This opens up the possibility of using the risk of bias assessment, rather than the lack of randomisation per se, to determine the degree of downgrading of a study result, and means that results of NRSI and randomised trials could be synthesised if they are assessed to be at similar risks of bias. In general, however, we advocate analysing these study designs separately and focusing on evidence from NRSI when evidence from trials is not available. The ROBINS-I tool is reproduced from riskofbias.info with the permission of the authors. The tool should not be modified for use. We thank Professor Jan Vandenbroucke for his contributions to discussions within working groups and during face-to-face meetings. Professor David Moher and Dr Vivan Welch contributed to the grant application and to initial discussions. We thank all those individuals who contributed to development of ROBINS-I through discussions during workshops and training events, and through their work on piloting. Contributions of authors: JACS, BCR, JS, LT, YKL, EW, CRR, PT, GAW, and JPTH conceived the project. JACS, JPTH, BCR, JS, and LT oversaw the project. JACS, DH, JPTH, IB, and BRR led working groups. MAH developed the idea of the target trial and its role in ROBINS-I. NDB and MV undertook cognitive testing of previous drafts of the tool. All authors contributed to development of ROBINS-I and to writing associated guidance. JACS, MAH, and JPTH led on drafting the manuscript. All authors reviewed and commented on drafts of the manuscript. Funding: Development of ROBINS-I was funded by a Methods Innovation Fund grant from Cochrane and Medical Research Council (MRC) grant MR/M025209/1. Sterne and Higgins are members of the MRC Integrative Epidemiology Unit at the University of Bristol, which is supported by the MRC and the University of Bristol (grant MC_UU_12013/9). This research was partly funded by NIH grant P01 CA134294. Sterne was supported by National Institute for Health Research (NIHR) Senior Investigator award NF-SI-0611-10168. Savović and Whiting were supported by NIHR Collaboration for Leadership in Applied Health Research and Care West (NIHR CLAHRC West). Reeves was supported by the NIHR Bristol Biomedical Research Unit in Cardiovascular Disease. None of the funders had a role in the development of the ROBINS-I tool, although employees of Cochrane contributed to some of the meetings and workshops. The views expressed are those of the authors and not necessarily those of Cochrane, the NHS, NIHR, or Department of Health. Competing interests: All authors have completed the ICMJE uniform disclosure form at http://www.icmje.org/coi_disclosure.pdf and declare: grants from Cochrane, MRC, and NIHR during the conduct of the study. Dr Carpenter reports personal fees from Pfizer, grants and non-financial support from GSK and grants from Novartis, outside the submitted work. Dr Reeves is a co-convenor of the Cochrane Non-Randomised Studies Methods Group. The authors report no other relationships or activities that could appear to have influenced the submitted work. Provenance: The authors are epidemiologists, statisticians, systematic reviewers, trialists, and health services researchers, many of whom are involved with Cochrane systematic reviews, methods groups and training events. Development of ROBINS-I was informed by relevant methodological literature, previously published tools for assessing methodological quality of non-randomised studies, systematic reviews of such tools and relevant literature, and by the authors’ experience of developing tools to assess risk of bias in randomised trials, diagnostic test accuracy studies, and systematic reviews. All authors contributed to development of ROBINS-I and to writing associated guidance. All authors reviewed and commented on drafts of the manuscript. J Sterne will act as guarantor. Black N. Why we need observational studies to evaluate the effectiveness of health care. BMJ1996;312:1215-8. doi:10.1136/bmj.312.7040.1215 pmid:8634569. Feinstein AR. An additional basic science for clinical medicine: II. The limitations of randomized trials. Ann Intern Med1983;99:544-50. doi:10.7326/0003-4819-99-4-544 pmid:6625387. Strom B. Overview of automated databases in pharmacoepidemiology. In: Strom BL, Hennessy S, eds. Pharmacoepidemiology. 5th ed. Wiley, 2012. Sanderson S, Tatt ID, Higgins JPT. Tools for assessing quality and susceptibility to bias in observational studies in epidemiology: a systematic review and annotated bibliography. Int J Epidemiol2007;36:666-76. doi:10.1093/ije/dym018 pmid:17470488. Deeks JJ, Dinnes J, D’Amico R, et al. International Stroke Trial Collaborative Group European Carotid Surgery Trial Collaborative Group. Evaluating non-randomised intervention studies. Health Technol Assess2003;7:iii-x, 1-173. doi:10.3310/hta7270 pmid:14499048. Wells GA, Shea B, O’Connell D, et al. The Newcastle-Ottawa Scale (NOS) for assessing the quality of nonrandomised studies in meta-analyses. 2008. http://www.ohri.ca/programs/clinical_epidemiology/oxford.asp (accessed 1/03/2016). Downs SH, Black N. The feasibility of creating a checklist for the assessment of the methodological quality both of randomised and non-randomised studies of health care interventions. J Epidemiol Community Health1998;52:377-84. doi:10.1136/jech.52.6.377 pmid:9764259. Higgins JPT, Altman DG, Gøtzsche PC, et al. Cochrane Bias Methods Group Cochrane Statistical Methods Group. The Cochrane Collaboration’s tool for assessing risk of bias in randomised trials. BMJ2011;343:d5928. doi:10.1136/bmj.d5928 pmid:22008217. Whiting PF, Rutjes AW, Westwood ME, et al. QUADAS-2 Group. QUADAS-2: a revised tool for the quality assessment of diagnostic accuracy studies. Ann Intern Med2011;155:529-36. doi:10.7326/0003-4819-155-8-201110180-00009 pmid:22007046. Whiting P, Savović J, Higgins JPT, et al. ROBIS group. ROBIS: A new tool to assess risk of bias in systematic reviews was developed. J Clin Epidemiol2016;69:225-34. doi:10.1016/j.jclinepi.2015.06.005 pmid:26092286. Institute of Medicine. Ethical and Scientific Issues in Studying the Safety of Approved Drugs.The National Academies Press, 2012. Hernán MA, Robins JM. Using big data to emulate a target trial when a randomized trial is not available. Am J Epidemiol2016;183:758-64. doi:10.1093/aje/kwv254 pmid:26994063. Mansournia MA, Higgins JPT, Sterne JAC, et al. Biases in randomized trials: a conversation between trialists and epidemiologists. Epidemiology [forthcoming]. Hartling L, Hamm MP, Milne A, et al. Testing the risk of bias tool showed low reliability between individual reviewers and across consensus assessments of reviewer pairs. J Clin Epidemiol2013;66:973-81. doi:10.1016/j.jclinepi.2012.07.005 pmid:22981249. Turner RM, Spiegelhalter DJ, Smith GCS, Thompson SG. Bias modelling in evidence synthesis. J R Stat Soc Ser A Stat Soc2009;172:21-47. doi:10.1111/j.1467-985X.2008.00547.x pmid:19381328. Wilks DC, Sharp SJ, Ekelund U, et al. Objectively measured physical activity and fat mass in children: a bias-adjusted meta-analysis of prospective studies. PLoS One2011;6:e17205. doi:10.1371/journal.pone.0017205 pmid:21383837. Guyatt GH, Oxman AD, Schünemann HJ, Tugwell P, Knottnerus A. GRADE guidelines: a new series of articles in the Journal of Clinical Epidemiology. J Clin Epidemiol2011;64:380-2. doi:10.1016/j.jclinepi.2010.09.011 pmid:21185693. Sox HC, Greenfield S. Comparative effectiveness research: a report from the Institute of Medicine. Ann Intern Med2009;151:203-5. doi:10.7326/0003-4819-151-3-200908040-00125 pmid:19567618. Bjelakovic G, Nikolova D, Gluud LL, Simonetti RG, Gluud C. Mortality in randomized trials of antioxidant supplements for primary and secondary prevention: systematic review and meta-analysis. JAMA2007;297:842-57. doi:10.1001/jama.297.8.842 pmid:17327526. Hernán MA, Alonso A, Logan R, et al. Observational studies analyzed like randomized experiments: an application to postmenopausal hormone therapy and coronary heart disease. Epidemiology2008;19:766-79. doi:10.1097/EDE.0b013e3181875e61 pmid:18854702. Golder S, Loke YK, Bland M. Meta-analyses of adverse effects data derived from randomised controlled trials as compared to observational studies: methodological overview. PLoS Med2011;8:e1001026. doi:10.1371/journal.pmed.1001026 pmid:21559325. Schünemann HJ, Tugwell P, Reeves BC, et al. Non-randomized studies as a source of complementary, sequential or replacement evidence for randomized controlled trials in systematic reviews on the effects of interventions. Res Synth Methods2013;4:49-62. doi:10.1002/jrsm.1078 pmid:26053539.